India has begun its first poverty alleviation project in China, sponsoring a farmers’ training and information center in Ningxia. he first-ever India funded project, which is really a diplomatic initiative to connect with a provincial government, was inaugurated by Nirupama Rao, Indian ambassador in China, and Wang Zhengwei, chairman of the Ningxia Hui Autonomous Region, in Liangtian township on Saturday. The NHAR is jointly funding the project with the Indian government. Another initiative involved funding an Indian style Buddhist temple close to the historic While Horse temple in Luoyang in Henan province. But this is the first opportunity for both Chinese and Indian officials to share experiences on poverty eradication. Rao said as much at the opening ceremony when she highlighted the similarity of developmental imperatives in India and China. 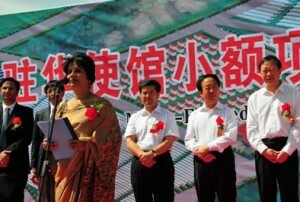 She called for greater understanding and awareness about each other at the frontline of developmental activities. See also past posts on India relations.